Continuing the story of the major arcana, looking at differences in the original Rider-Waite (RW) tarot versus the Angel tarot we come next to 6-The Lovers. When this card is drawn people usually see it as a good thing. Yay! love! Well, that is partially true. This card represents a divine calling of some type, but may not necessarily be related to romantic feelings. In the Rider-Waite (RW) tarot you see the male and female naked before each other and in front of a great angel with arms stretched outward. This indicates that the two are together not by choice but by a power larger than they. 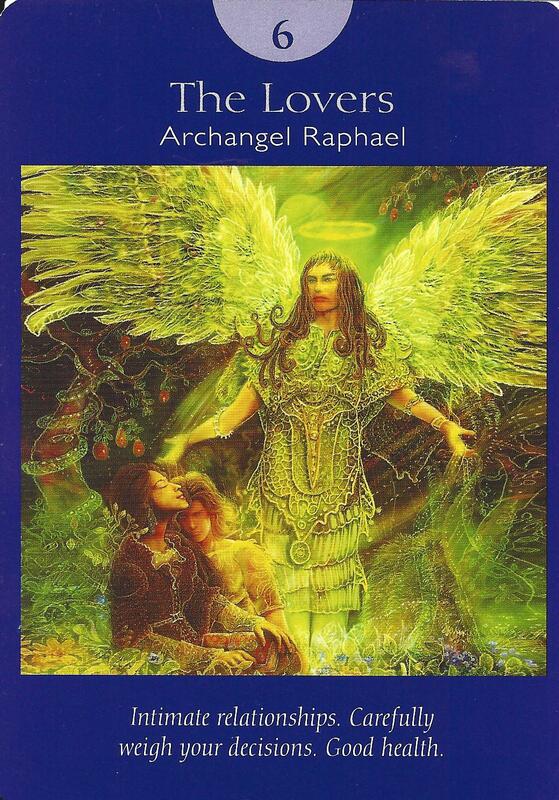 In the Angel tarot, the two are together but they are clothed in front of Archangel Raphael with arms open. The meaning of The Lovers card can be a powerful, long-lasting love is coming. It can represent a soul relationship. But more importantly, The Lovers card indicates we must make conscious choices and sometimes following our heart is the best choice to make. In the journey, this is where The Dreamer learns of romantic love. From a symbolic perspective, The Lovers card represents duality–female and male, yin and yang; opposites attract and help us to learn and grow. 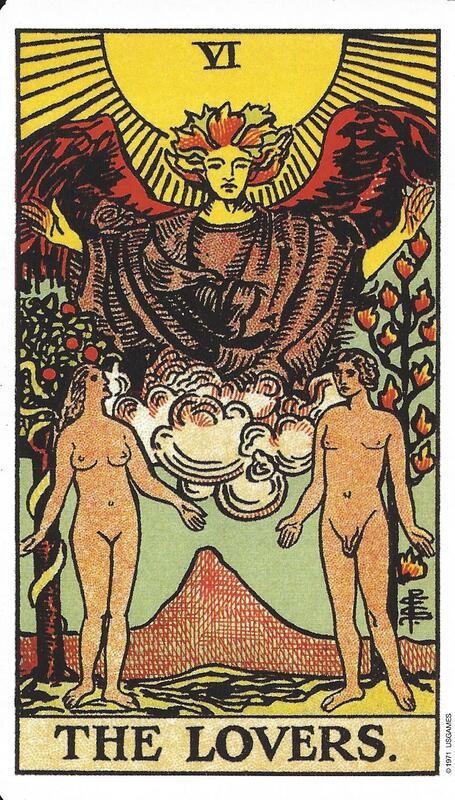 In the RW tarot, the male and female are symbolic of Adam and Eve. The tree behind Adam is the Tree of Life with twelve fruits and behind the woman is the Tree of Good and Evil as evidenced by the serpent twining around it. This indicates a sense of innocence and youth before tainted by materialism. In the Angel Tarot, the Tree of Good and Evil is also found behind the couple. However, the Tree of Life is changed to a tree with five fruits representing the five senses, aligning with the body and soul. The flowers in the Angel tarot are symbolic as well. Violets represent fidelity and love, while marigolds are associated with healing, hence the presence of Archangel Raphael. Archangel Raphael’s name means “God heals.” The number 6 is a number that focuses on worldly concerns and reflects love, understanding, and nurturing. When this card is drawn it can represent a new, romantic love or it might be a platonic friendship. In either case, communication is important and it is important that the Querent feel safe enough to share feelings. It can also mean an important decision about life. The choices you make now will greatly influence your future so you want to make sure you take time to thoroughly consider all aspects. The Lovers card can also represent a need for balance or more emphasis on good health.